We got engaged at the end of October 2013, after finishing our first marathon. We were sweaty. I was cranky. He almost proposed in front of a row of porta-potties. You can read that story here. 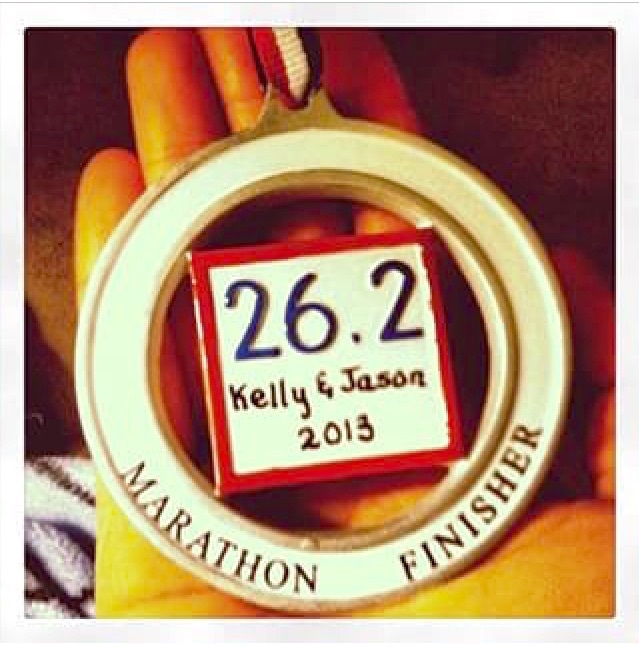 At Christmas, my dear friend Susan gifted us our first tree ornament: a circular medallion that reads, Kelly & Jason, marathon finishers. “You’re about to begin the longest marathon of your life, so I thought this would be appropriate!” she wrote. I thank my God every time I remember Jason. In all my prayers for Jason, I always pray with joy because of his partnership in the gospel from the first day until now, being confident of this, that he who began a good work in Jason will carry it on to completion until the day of Christ Jesus. It is right for me to feel this way about Jason, since I have Jason in my heart and, whether I am in chains or defending and confirming the gospel, Jason shares in God’s grace with me. God can testify how I long for Jason with the affection of Christ Jesus. And this is my prayer: that Jason’s love may abound more and more in knowledge and depth of insight, so that Jason may be able to discern what is best and may be pure and blameless for the day of Christ, filled with the fruit of righteousness that comes through Christ Jesus – to the glory and praise of God. I have my my husband in my heart, and that is right. He shares in the same grace I do, the same grace I would fall flat on my face (daily) without. My husband is a partner in the gospel, in God’s great story. Not a bystander — a partner. God is working in him, and will complete His work no matter if it takes until kingdom come. This powerful prayer reminds me that no matter the dirty dishes still in the sink, the disagreements about money, or the lack of Insta-worthy flowers delivered, I’m still thankful for him. He sees my worth when I don’t. He tolerates my nagging and my outbursts, and takes me in his arms with an “I love you” when we’ve run out of mean things to say to each other for the moment. He loves me so well — and not in a Facebook humble brag, re-tweetable, best-Instagram-post-ever way, but in a way that is genuine, compassionate and deeply selfless. Try this passage out on someone you love. Speak out their name — say it aloud; it’s more powerful that way. Thank God that He has given you such a wonderful name to speak out loud, as often as you’d like. Then get back in your marathon with your beloved.